These hilarious books were my introduction to the humor section in bookstores and libraries. When I flipped through the first one and started laughing and snorting in the middle of the store, I realized I had to buy it…and the three “sequels”. 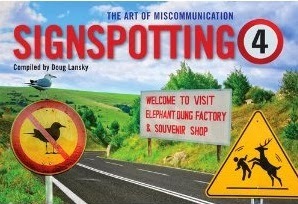 The “author,” Doug Lansky, started collecting photos of funny signs he saw on his travels. 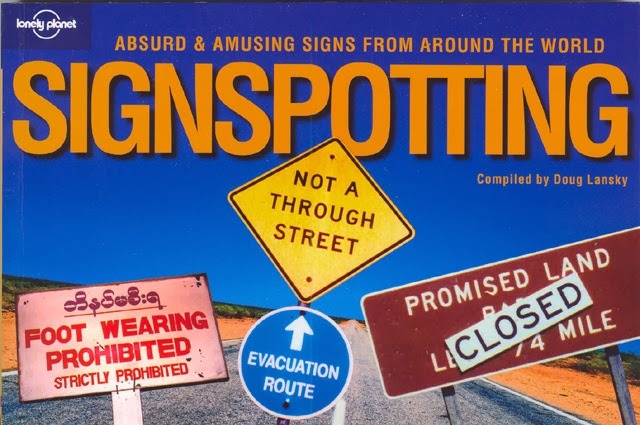 That turned into a website, which turned into this hysterical collection of humanity’s worst signs. The book is primarily photos of these amusing signs, but don’t overlook the sarcastic comments inserted below each selection. Sometimes those made me laugh harder than the sign itself. It’s hard to pick favorites from such an impressive (Is that word?) collection, but I’m going to mention some of the signs that made me laugh out loud. In the first book, I love the road sign that says “Keep your eyes open” and the mocking note below commenting, “Perhaps it’s part of a helpful driving-tip series: ‘sit up’ and ‘keep breathing’ signs are up ahead.” This is definitely a visual book, though…as evidenced by the sign that says “Dangerous intersection ahead.” Not funny in itself, but alarmingly hilarious when you note that the sign contains dozens of bullet holes. Mentioning some specific entries that made me laugh feels a little silly, because in full honesty almost every single one of these hundreds of signs had me giggling and chuckling. Not to mention since the discovery of these books, I peruse and purchase from the humor section more often…which equals many more smiles and laughs. “New Adult” is a fairly recent term in literature that’s old news to some bibliophiles and still breaking headlines for many other readers. Some think it’s a great concept and others unnecessary. I fall in the former category, but first a definition: have you ever read a book that you thought could be categorized as either young adult or adult? That’s New Adult. People already use the term “crossover appeal” and this is an extension of that phrase. In terms of age, the protagonist is often college or early twenties and thematically we’re talking conflicts that ride a line between teenage and adult problems. Usually these are books that can and do sell to both markets. While I say I’m entirely on board with “New Adult,” I should specify: for terminology but not shelving. I think it’s great to have a specific term for those books that almost slip between the cracks of target age range, as well as a label that expressly markets something as having crossover appeal. However, I definitely do not think New Adult needs a special shelf of its own in bookstores, libraries, etc. That would be a third potential category to put something and, thus, confuse readers about where they should be looking. And for that matter, if New Adult is the grey area between Young Adult and regular Fiction, well, where do we draw the line at subcategories? There are even more grey areas in between Young Adult and New Adult. Are we going to come up for a new label for those books about which we can’t decide whether it has enough crossover appeal to merit a New Adult label? So my opinion on New Adult: useful term for reviews and discussion but I sure hope we don’t start pulling novels from existing categories for an entirely new shelf! 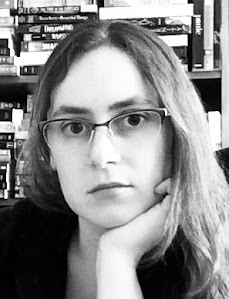 CODE NAME VERITY by ELIZABETH WEIN: Most likely shelved in Young Adult simply due to the teenage heroine, but said heroine is an Allied spy capture by the Gestapo. Needless to say…intense themes about war. Plenty of adults have been reading this book, too, as well as selecting it for discussion in their book groups. NINETEEN MINUTES by JODI PICOULT: The author alternates perspectives in this novel about a school shooting. Some main characters are teenagers and others adult, but the core conflict revolves around this extreme act of violence at a high school. I’ve seen this in both Young Adult and Fiction sections. PREP by CURTIS SITTENFELD: This controversial novel stars a teenage girl at a prep school, but usually finds itself shelved in adult fiction for the mature sexual themes. Those are merely a few titles that exemplify how this New Adult label does indeed fill a demand in describing a book. What are your thoughts on New Adult? Any books you think fall into this subcategory? Chet, the narrator of this delightfully entertaining mystery series, won me over in the first book and left me eager to read the rest of his adventures. 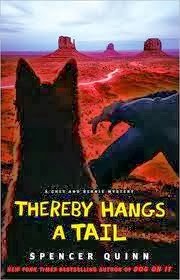 In this second installment, Bernie (Chet’s owner and a private investigator) is hired as a bodyguard for an award-winning show dog who has recently been threatened. As with the first book, the story does not proceed in a linear, orderly fashion but twists and turns down entirely unexpected corners. The style of narration won’t appeal to everyone. Quinn writes these novels from the perspective of Chet the dog, companion to the private investigator Bernie. Anthropomorphized animals are always tricky, because where’s the line between how they think like a human and how their thought process differs? At times Chet’s worldview can seem somewhat arbitrary in terms of what human phrases he understands and what simple words confuse him, but all in all Chet has the air of a simple-minded but endearingly trusting and friendly character. As for narration taste, his attention span will amuse some readers and irritate others. When I say the story twists and turns, I mean that doubly: on the one hand because the plot develops in directions the reader won’t likely suspect and on the other because Chet is, let’s say, easily distractible. He’ll pick on a major clue only to be sidetracked by a good smell, favorite toy, interesting person, etc. This builds a sense of dramatic irony to the books that feels unlike anything else I’ve read. Of course, this hyper tangent-tendency becomes a huge part of why Chet feels so real. In writing myself, I’ve learned about the importance of getting into a character’s head. Rather than a simple scene where they walk from point A to point B, throw in details that build the individual: a leaf blowing by reminds them that they need to rake their backyard, a smell of cinnamon buns brings forth memories of their deceased mother who baked those every Sunday, they almost trip and flash back to an embarrassing fall in high school. Real people think in tangents….which means Chet must be a real “person” multiplied by a factor of at least 10. In every chapter, sometimes multiple times within a page, some detail sends Chet off on digressions that lead from an observation to a memory and perhaps to a memory after that and after that. While this narration style obviously amuses, after awhile another strength emerges: Chet increasingly becomes the most well-developed character in the series! He has countless backstories, some big and some small, and we’re entirely in his doggy mind. Telling people how to handle their pets often overlaps with the dangers of telling a parent how to raise their children. As someone with plenty of dog training experience myself, I can’t help but notice when people (fictional and real alike) do things with their pets that 1. I wouldn’t do or 2. I consider flat-out irresponsible. Note here that any of my criticisms are purely about Bernie as a pet owner and not meant as a negative against the book. Bernie clearly loves Chet, but he’s one of those pet owners who treats his dog like a person rather than a dog. (In some ways that’s fitting for this series, since Chet’s perspective imagines him as more human-like than a real dog.) Besides taking Chet into dangerous situations, my more minor quibble is how much human food Bernie feeds his dog! He’s always giving Chet scraps and junk food and oh so many donuts. A scene in which Bernie throws the rest of his apple to Chet particularly stood out to me regarding this topic, since most dog experts know apple seeds are poisonous. Highly unlikely to kill a dog based on one apple (we're talking small quantities of poison), but toxins nonetheless that a responsible pet owner shouldn’t be feeding their beloved companion! This is a tangent of my own, but I can’t help hoping Bernie might change his ways regarding this habit, at least a little, as the series progresses. These are especially fast reads and when I looked closer the reason became immediately apparent: there’s a lot of dialogue, often quite brief exchanges. In terms of a page view this means lots of chunks of very short paragraphs that make one page go by particularly fast. In fact, I would be curious to know the word count of this novel. It’s around 310 pages, but read more like 150 to me. I would recommend these reads to pretty much anyone except those who can’t stand a narrator prone to frequent irrelevant tangents. They’re light, easy, fun, laughter-inducing, and emotionally affecting. Great for dog lovers, mystery fans, anyone who likes a good laugh, or readers looking for something lighter to “cleanse their literary palate” between darker or deeper books. It probably won’t be long before a review of the third book in this series goes up on my blog! Hey! Romance Ate the Rest of My Book! Discussion Topic: How Much Romance Do You Want in a Book? I, like many people, love a good romance, but I never like it when romance eclipses the rest of the story. Sometimes I’m reading a book that I almost want to rave about, except every time I start to get really into it romance comes along and steals focus from the bit I found more interesting. When a story is a romance, well, that might be the only exception. The marketing’s pretty clear about the focus. Even then, I don’t read very many romance novels because, for me, that can’t be the whole story. It’s very telling that many of my favorite books include fantasy romances, but no straight up romances. Fantasy romances inherently have at least one other conflict, a magical conflict, but if we’re talking about the romance genre specifically the books that will appeal to me the most are ones with characters who have other problems and goals besides the romantic relationship. Before I can care about this great love story, I need to care about these characters and to care about the characters I need to know their problems, goals, opinions, passions, fears, etc. I lose interest pretty fast when a character’s entire worldview revolves around their romantic interest. This is kind of a tricky discussion topic, because how do you measure the amount of romance in the book? It doesn’t make much sense to say, “I like exactly 18% romance in a story.” And the truth is I don’t mind more romance than usual if it’s hooking me. In other words, I’m not down on romance in general but I’m a very critical romance reader so a big part of why I often don’t want as much in a book is because the author isn’t writing a romance I find satisfying. Like any other plot thread, if I find it boring, overly dramatic, cheesy, cliché, frustrating, etc., then I’ll wish for less of that unsatisfying plot thread and more of the ones I do like. I also dislike the assumption that all stories need romance. I see this opinion both as a reader and a writer. Sometimes why romances fall flat may be because that book didn’t need it; the author squished it into a story that was really about something else. How about you? Do you share my frustration with romance crowding out the rest of a good book? Or do you find yourself generally happy with the balance of romantic and other plot threads in the stories you read? Iceland. 1829. A woman convicted of a brutal murder. Or two. A family charged with housing her on their isolated farm until her execution. All based on real history, mind you. This isn’t my usual reading taste and yet I suspected I would like it. I suspected right. Ages has been accused and found guilty of the vicious murder of two men. The family responsible for housing her is understandably upset about the arrangement. They make the most of the situation and put her to work as a servant. Agnes proves a helpful addition to the farm, but her quiet, subdued manner unsettles everyone as they search for hints of the evil murderer from all the gossip. When a reviewer uses the term “easy read” it can mean different things. I usually use that phrase to refer to the writing style. Some texts challenge you or ask for focused attention while others are…easy reads. In this case, though, when I say BURIAL RITES is an easy read, I mean that I invested easily. I never fell out of the story or struggled reconnecting after breaks between reading sessions. Kent ensures the path from reality to her imaginary world is so clear that you don’t even notice the entrance as you step over the threshold. My only minor quibble with the book is that sometimes I wanted less suspense. I’ve mentioned before on this blog my frustration with withholding information to keep the reader reading. In my opinion, when a story’s really good you don’t need some juicy “don’t-you-want-to-know” bait hanging in front of you; you want to know what happens next because you love the characters. I know a book’s brilliant when I’m gripped by the most mundane scenes. 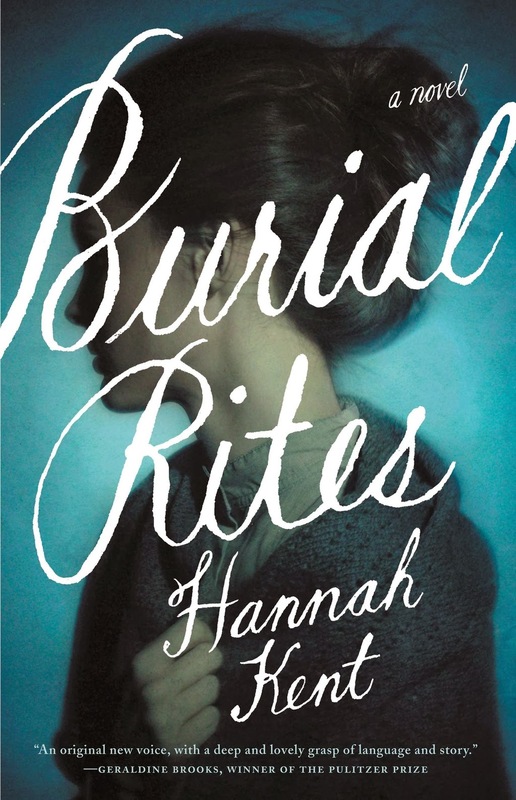 With BURIAL RITES, I definitely loved the characters enough to keep reading, but I often felt the author pulling me along with the unnecessary promise of lurid details about the murders. Did Agnes actually do it? Was she provoked? Justified? Did the men wrong her? Was it a wrong worthy of murder? Or is she just crazy and violent like everyone says? Keep reading and you’ll find out. Personally, I would have enjoyed the story more if we knew what happened regarding the murders up front and the book focused exclusively on Agnes’ relationship with this family. In fact, this novel exemplifies why I don’t like that suspense “keep reading and I’ll tell you” technique. Once we learn exactly what happened regarding the murders, it can’t live up to all the scandalous speculating I had been doing for hundreds of pages. That criticism aside, this book also exemplifies masterful pacing. What really makes the novel worthwhile is the relationships Agnes forms with this family, individually and as a unit. From the premise alone I don’t count it as a spoiler to say the family’s opinions about Agnes change over the course of the story. In fact, that’s the point of the story. At the core, this is a familiar fable about how people aren’t always what they seem. The judgments we make of strangers will naturally shift when we actually spend time with the individual. Another good indicator of a book’s strength is the reader’s emotional connection. Five out of five stars there. The novel repeatedly riled me up on behalf of fictional characters. Kent delivered an impressive debut and I look forward to reading whatever she writes next. The phrase "don't judge a book by its cover" has become so common it's used as a metaphor even outside of book-related topics, but is judging covers really such a terrible crime? Over the years, I have heard countless people claim they never fall into this pitfall, but I am of the opinion that everyone judges books by their covers. Of course, that's a broad statement. In reality, I imagine this habit on a kind of sliding scale where some people consciously set down books whose covers they dislike and others are moved by tendencies so subtle that they don't notice them. The fact remains that something made you pick up that book from all the others. If you were looking for that specific book, this debate doesn't really apply, but what if you weren't? If you were browsing? Then why that book rather than all the others? Maybe it was an interesting title, but perhaps the title is big enough to catch your attention, or in a font you particularly like. Perhaps you like the color: bold, soft, simple white, your favorite, or even an unusually complicated design. Maybe you recognize the cover or title - whether because you've seen images in advertising or the designers deliberately went for a familiar theme. This is exactly why "faced out" books have such an advantage in a bookstore. (For those who don't know, that refers to books with their covers facing out on shelves while most of the others show only their spines.) People notice covers more than spines! I also think it's a little insulting to graphic designers: pretending people don't notice book covers. Why, then, can individuals make a career out of designing covers? I do want to mention that in most cases the author has little to no say in this matter, but ideally the cover should capture the essence of the book. Speaking generally, genre books often have similar design elements as their "peers" to help pull in those particular readers. More specifically, the cover can showcase some of the major characters, settings, themes in a book in an effort to attract readers interested in those things. We are taught that "judging a book by its cover" is a terrible sin, especially for avid booklovers (who should know better!). Yet urging people not to judge the cover of a book is urging them not to be human. (The only people who probably don't judge books by covers are the blind.) Basic human psychology tells us that we react differently to different visual stimuli. Any competent artist or graphic designer knows this. If people didn't judge books by their covers, those designers would be out of a job! So next time you're browsing for a good read and pick up a book at random, take a moment and ask yourself what drew you to that book. The cover? The title? Perhaps you always go third shelf down, eighth book to the right? Maybe ask yourself what other judgments you might be making based on the cover. 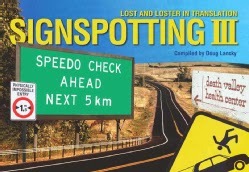 Of course, before finalizing any conclusions…read the book!